Fiskar’s 6 1/2” Paper Crimper Excellent Condition. It's easy to create a beautiful, embossed design into paper and more with the Corru-Gator. Easy-turn knobs feeds through paper up to 8-1/2" wide. Plastic rollers and body. Straight, Ridged Pattern. Fiskars PAPER CRIMPER Crafting Craft Tool 6.5"
Creating beautiful and uniform patterns with this tool. It is a good tool to make flower paper picture for your friend or family. Simple structure, easy to use, the handle assembled by yourself and do not take up the space. Can be attached to any surface. Made from steel, the dial is the only plastic piece on this tool. For making the fold and wave effect of Quilling papercraft. - Put the quilling scrip into the gear gap, then turn the disc (the scrip must snap and stick to the shaper). Material：plastics. - Light and simple,easy to use. EK Success-Paper Crimper. Create unique textured features for use on cards and pages. Fiskars Paper Crimper (12-93408897), New, Free Shipping. Condition is New. Shipped with USPS Priority Mail. Fiskars Extra Wide Roller Paper Crimper 6.75" Wide Tool Crafting Scrapbooking 9. Material: Plastic Stainless Steel Needle. Color: Pink (As Picture Shows). Rate (item arrived). Canada Rate (item arrived) 0.0% 47.1% 31.4% 17.6% 3.9%. 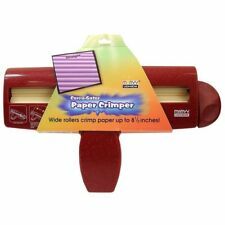 Now crimping paper has never been easier with this new Deluxe Crimper! 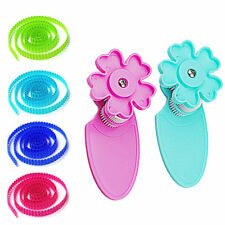 Made specifically for quilling in mind, this crimper can produce2 different crimp sizes (coarse or fine). Deluxe Crimper - Quilling Tool. This paper crimper is in excellent working condition. Great for scrap booking and paper crafting. Textures paper in a crinkle format. Quilling Comb Handle Size: Approx. 8 x 13.7cm. 13.7 x 8cm. Mainly used for DIY paper craft, using our quilling tool kit to make a variety of beautiful and delicate shapes, such as flowers, animals, bicycle, leaves and so on, and these paper crafts are used to decorate your photo album, scrapbooks etc. Fiskars Straight Edge Paper Crimper Tool ~ 8.5" x 6" x 3" 6.75" roller. Fiskars Paper Crimper 6-1/2" - never used. Very cool paper crimper rubber type roller, very light used. Scrapbooking Fiskars Paper Crimper Roller - 6.5"
This crimper had very little use. It works great and adds great texture to any project. If you have any questions or would like more pictures feel free to contact me. For making the fold and wave effect of Quilling papercraft. Put the quilling scrip into the gear gap, then turn the disc (the scrip must snap and stick to the shaper). Size：as shown in pic. Also note that monitor settings may vary from computer to computer and may distort actual colors. This Paper Corrugater is very easy to use. Make sure the paper is straight. Squeeze the colored handles together in the middle of the bar. Turn the knob to corrugate. If your paper starts to move to one side, stop and re-straighten your paper. Brayer was used and has staining on the rubber piece from use. For Sale - Lot of 2 scrapbooking tools. This will ensure that you have the correct total. It's easy to create a beautiful, embossed design into paper and more with the Corru-Gator. Easy-turn knobs feeds through paper up to 8-1/2" wide. Plastic rollers and body. Wavy Pattern. 5" paper crimper making diamond shapes and a 2" Speedball brayer - just finding duplicates in my crafting supplies. Create unique textured features for use on cards and pages. Trending at $17.82eBay determines this price through a machine learned model of the product's sale prices within the last 90 days. Just squeeze the handle and roll the paper through. 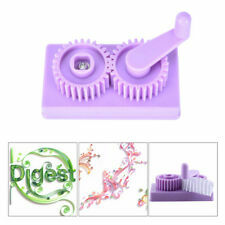 Fiskars Paper Crimper, Paper Corrugator. Smart design requires very little pressure to crimp paper. For making the fold and wave effect of Quilling papercraft. Put the quilling scrip into the gear gap, then turn the disc (the scrip must snap and stick to the shaper). 1 x Wave shaper. Size：as shown in pic. 1 x Quilling Comb. 15 long all-steel combs will never rust! Material: Plastic Stainless Steel. Color: Random Color. Our goal is. (Yosoo Paper Crimper Crimping Tool, Paper Slip Wave Shaper Making Tool Paper Quilling Papercraft Origami Craft DIY Quilling Supplies Handmade Decor. snap and stick to the shaper). Put the quilling scrip into the gear gap, then turn the disc (the scrip must snap and stick to the shaper). Lot of Punches and Crimper. - Fiskars Crimper. - Fiskars Border Punches: Diamonds and Hearts. - Corner Adorners: Trumpet Flower and Graceful Heart. Paper Embosser Scrapbooking Collection Essentials Hand Held Plastic Crimper set w/4 Different Designs. Crab, Lobster, Starfish, Sea Urchin. Paper Embosser Scrapbooking Collection Essentials Hand Held Plastic Crimper set w/4 Different Designs. Designs: Teddy Bear, Rocking Horse, Rubber Ducky, Baby Foot Print. 1 x Quilling Comb. 15 long all-steel combs will never rust! Material: Plastic Stainless Steel. Color: Random Color. Our goal is. Length: Approx. Baby Product. APPLICATION: Making paper strip to be wave shape. EASY TO USE: Simple structure,easy to use,the handle assembled by yourself and do not take up the space. DESIGN: Simple structure, easy to use, the handle assembled by yourself and do not take up the space. Item : Lot of (8) FISKARS Paper Edgers Scissors, Circle Cutter, Paper Roller Crimper for Scrapbooking/Crafts. Blank Colorful greeting card 2. 3 Row different shape curling tool 1. 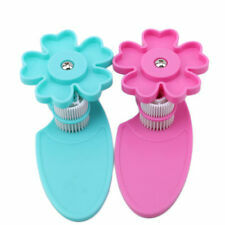 Flower shape curling tool 1. A4 Color Paper 2. 12 x bags of Quilling paper (9 bags for gradient colors, 2 bags for 39x0.5cm 24 colors, 1 bag for 54 x 0.5cm 24 colors). 1 x Paper Quilling Pen. 1 x Quilling Board. 1 x Quilling Comb. 5 x Paper Crimper Tower. 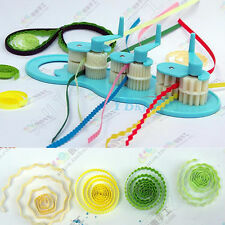 Quilling half ball making board mini mould. Quilling comb. Use to make a flat quilling coil into a half ball coil. Make a long quilling coil like a branch. It is very useful when you pick up or hold a small object such as a paper roll. 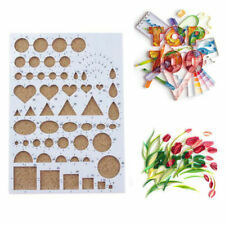 This set is a treasure which includes a variety of quilling tools. They are mainly used in DIY paper craft making a variety of beautiful and delicate shapes of paper crafts, such as flowers, leaves, animals and so on. Quilling Comb Handle Size: approx. Quilling Comb Handle Size:approx. 1 x Quilling Crimper. 1 x Quilling Ruler. 1 x Quilling Comb (Send by random). Mainly used for DIY paper craft, using our quilling tool kit to make a variety of beautiful and delicate shapes, such as flowers, animals, bicycle, leaves and so on, and these paper crafts are used to decorate your photo album, scrapbooks etc. For making the fold and wave effect of Quilling papercraft. Put the quilling scrip into the gear gap, then turn the disc (the scrip must snap and stick to the shaper). Size: 45 21.5 12mm. If you do not receive our reply within 48 hours, pls.